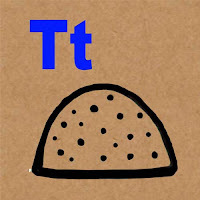 Today's ancient Egyptian hieroglyphic is the letter "T". The bread loaf pictured above is the symbol for the Letter T in Egyptian Hieroglyphics. Toast is made from a bread loaf. Just think of slicing a bread loaf for "toast" and you'll have it!